KAMPALA, Uganda (CNN) -- Gunshots rang out in Uganda's capital Saturday in a fresh burst of unrest after loyalists of a traditional kingdom battled with government forces for a third day. Residents of the Kasubi suburb, west of Kampala, try to flee from violence as a soldier takes photos. Local media reports put the death toll at 13 since the rioting started, but attempts by CNN to confirm with local authorities were unsuccessful. 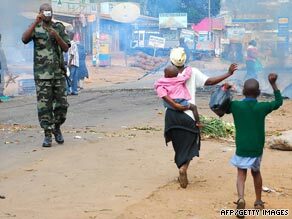 An uneasy calm had swept over Kampala early in the day as police and the army patrolled the city in military convoys. By midafternoon, witnesses reported gunshots and isolated cases of riots. The unrest Saturday started after rumors circulated by text messages that the king of the Buganda kingdom had been detained, said Judith Nabakooba, a police spokeswoman. But a Buganda kingdom official refuted the rumor. "It is not true -- the king has not been arrested, " David Mpanga said. Tensions between the Buganda kingdom -- headed by King Ronald Mutebi II -- and President Yoweri Museveni have intensified in recent years. The two sides spar over land, sovereignty and political power. Kings in the east African nation are limited to a ceremonial role overseeing traditional and cultural affairs. Museveni has accused the Buganda kingdom, which is made of of Bagandans, of receiving foreign funding to carry out a hate campaign against the government. Bagandans are the dominant ethnicity and one of four ancient kingdoms in the nation. Violence flared Thursday when the government said it would not allow the Buganda king to travel to an area inhabited by a renegade rival group. The president said he tried to contact the king to discuss the issue as "mature people," but he could not reach him by phone. After the travel ban, young Bagandans took the streets, stealing ammunition from a police station and confronting officers, whom they accused of harassment. Police and army officers were injured, and at least four people were killed, the nation's police chief, Maj. Gen. Kale Kayihura said Friday. Rioters also burned tires and cars, set buildings on fire and looted stores, according to witnesses. The streets in the capital were strewn with debris Saturday, including torched cars and burned tires. "Soldiers are walking in a single file, waiting for rioters and ready to confront them," said Allan Mugabi, a resident of Kampala.